If you're a business marketer and wondering about email marketing best practices, here are 119 facts worth exploring captured in an infographic. Email remains particularly effective. Yes, that's right. Email hasn't disappeared and isn't about to. Think of all the applications and social networks which depend on email for verification, interaction [think notifications] and even as reminders to return to individual networks. From a business perspective, emails are the most valuable customer asset available - when obtained legitimately and respected - for engagement, loyalty, relationship building and even sales. Did you know that consumers who make purchases through marketing emails wind up spending 138% more than those who don't receive email offers? Per 119 Facts You Don’t Know About Email Marketing (see Infographic below), 77% of consumers prefer receiving email for marketing communications and 85% of retailers consider email to be their most effective tool for acquiring new customers. 64% of decision-makers depend on email. Not only is email three times more likely to convert than social media, but with the ubiquity of mobile devices, you can read emails at any time and place and at your convenience. And plenty do: 91% of internet users check email at least once a day on mobile. Although email is particularly effective for retailers, it's equally valuable for other type businesses: 89% of marketers say that email is their primary source for lead generation. In other words, email is here to stay. Given my previous post titled Top Tips for Avoiding Spam Filters or How To Make it to the Inbox, it's time to explore these email facts in more detail to determine how to successfully get more business using email. Emails with 6-10 words in the subject line see the highest open rate (21%). Open rates for emails with movie titles or song lyrics in subject line increased by 26.2%. Red links drew 52% more clicks than blue links. Millennials want to see 39% fewer emails and 32% fewer repetitive emails from brands (me, too). Personalized subject lines result in a 26% higher open rate. Using the person's first name in the subject line increases the chance of the email being opened by 14.68%. Personalized emails improve the click-through-rate by 14% and conversion rates by 10%. Only send emails that your recipient will consider relevant. This is your opportunity to truly write a persuasive email that sets the stage for further interactions and, ideally, a long relationship. The better you can segment your list, the more you can customize your email message and increase its relevance. What about email send time and day? Picking the day and time of your email send matters because emails have the best chance of being opened within one hour of reaching the inbox. Which day and time, though, depends on the dynamics of your own list. If you don't have data, try Monday, Tuesday, and Wednesday. Monitor what happens and then adapt what you learn to your own dynamics. Think about your customer personas, what you know about their lives and your industry. Note that some email tools will suggest best times (e.g., MailChimp). Email read on mobile devices accounts for 15 to 70% email opens depending on your industry, audience, product and email type. The average unsubscribe rate is .25%. 66% of unsubcribes happen between 5 pm and 10 pm. 78% of consumers have unsubscribed because a brand was sending them too much email. 52.9% never 'opt down' or change email frequency or type after unsubscribing. 35.4% unsubscribe because emails were sent too frequently. So, don't overdo it [read How Not To Get More Business: 7 eMail Retail Experience Horrors! for ideas]. Another fact to keep in mind: 30% of your subscribers to your list change their emails on a yearly basis. What that means is that if you have a list of 100 names, after one year only 70 of them will be valid. Automated email messages average 70.5% higher open rates and 152% higher click-through-rates than regular emails. 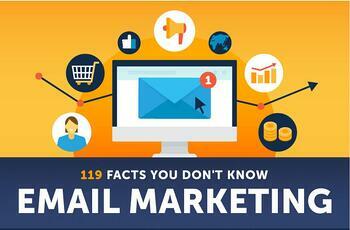 Definitely a goldmine of facts and stats about email! Make sure your message is relevant! What will you do differently when you next use email as part of your marketing? What do you think of these email stats? Do they inspire you to do more with your marketing? What might you try first? This article was originally published on Sept 12, 2012 and has been updated.